Home MY HOME Gina’s home: I finally have a driveway! 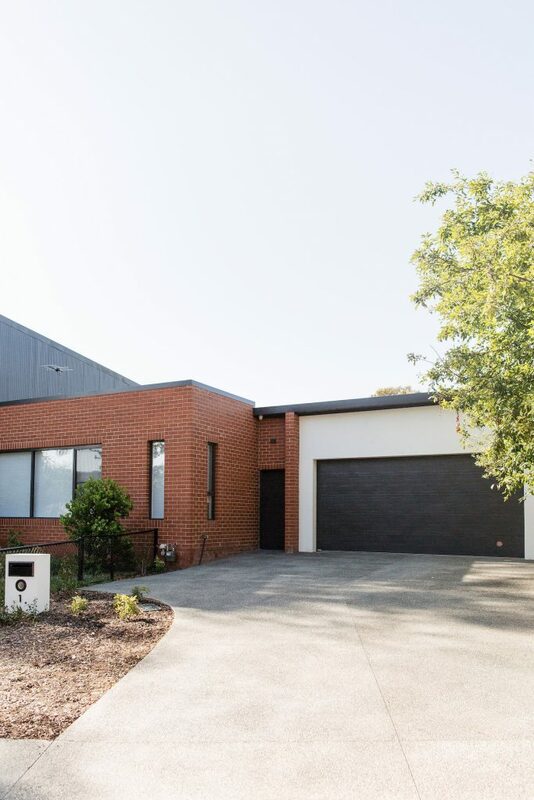 Those of you who followed our home build journey would know I completely blew our budget… Although, to be fair, we never really had a well-thought out budget to start with. I laugh when I think back to how we just winged the whole owner builder thing and figured it out as we went. But, turns out your build budget disappears VERY quickly! Especially when you get tempted by pretty (always equates to expensive) products or materials. After a few too many upgrades, the budget I had allocated to landscaping and driveway vanished. 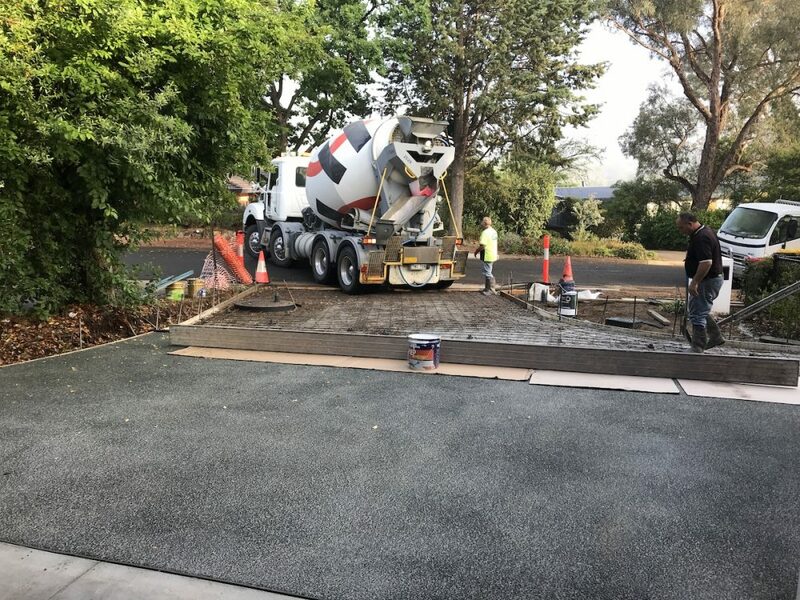 I decided it was better to wait and get the driveway I wanted rather than rush and put in a standard concrete driveway. After a long wait, we finally got it! Excuse the mess but this is the real before pic of our house, ha ha! As you can see, my ‘driveway’ for the past three years has been a gravel ramp. It did the job in the sense that we could get our cars in and out but it certainly didn’t look great and the loose gravel always ended up in our garage or washing away when there was heavy rain. It was only a temporary solution. The first step was to clean up the area. We removed that rubble of concrete (from our backyard), took out the tree stump, and got an excavator in to remove the gravel and dig around 200mm deep. Then it was on to set out, aka creating the formwork for the concrete to be poured. 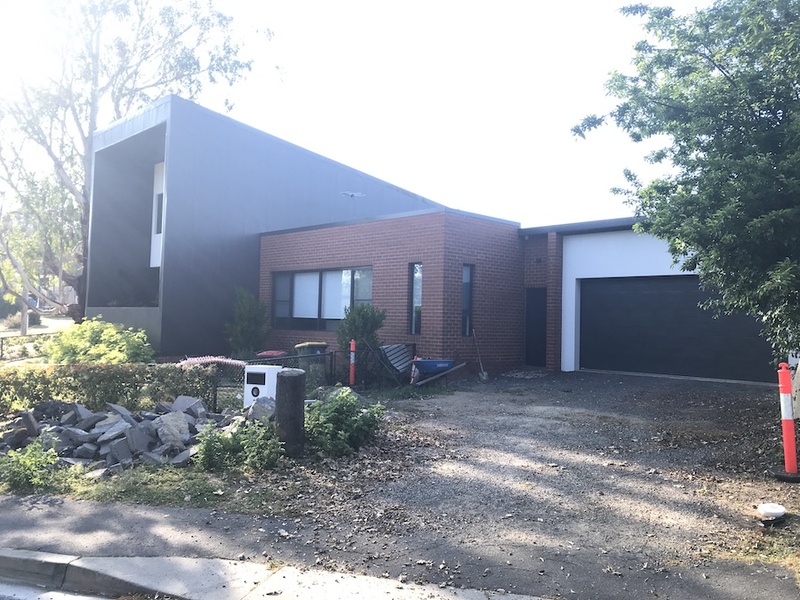 Of course, I don’t like to make things easy so rather than a straight driveway, I wanted to introduce some curves to soften the hard angles of our house. My step-father is a landscape architect and he drew this shape for us. Using timber planks and pegs, we were able to create the curve shape. Although it isn’t required, we added steel rio for added strength. After a few false starts because of weather, I can’t tell you how excited I was to see the first truck roll in to pour the concrete! 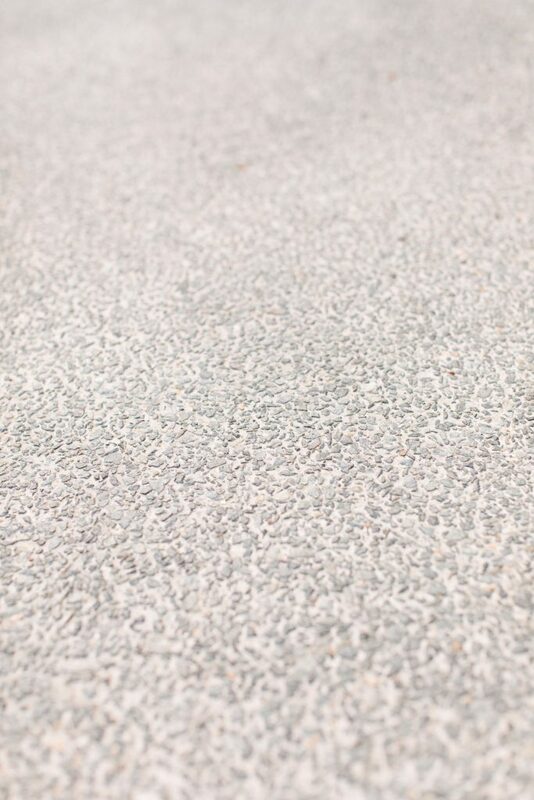 We selected a beautiful exposed concrete from Holcim’s Geostone range. It’s a natural look that adds character with a raw aesthetic. 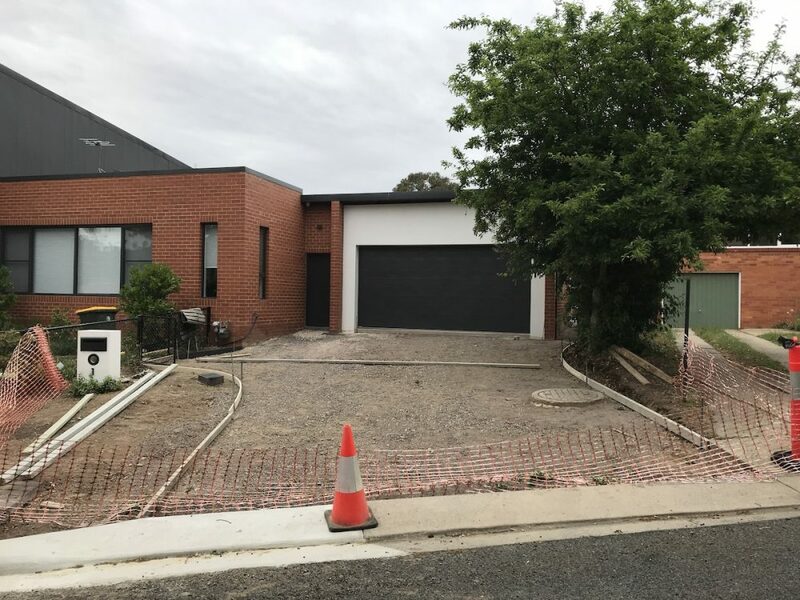 At first I was tempted by the more colourful exposed concrete’s in their range (I thought those with reddish pebbles could pick up the red brick of our house) but ultimately I decided I wanted an understated driveway and opted for a simple grey cement with blackish and grey stones. 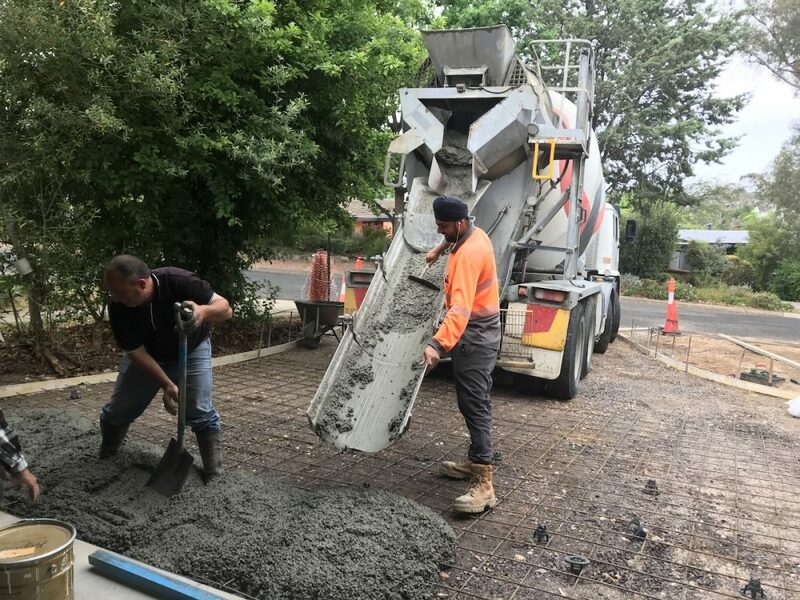 To achieve the exposed finish, the concreter needs to wash the concrete before it dries. 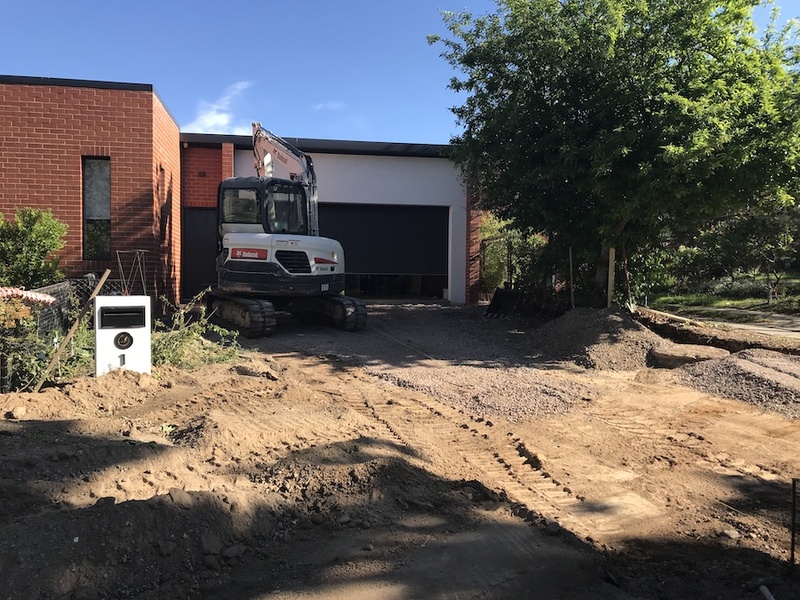 Given the size of the area (we also concreted down the side of our house), he wanted to do the driveway in two stages. You can see the area we poured on Day 1 in the pic below. After 48 hours, we were ready for the rest of the concrete to be poured. After two days, we had a person come to cut expansion joints (to prevent the driveway from cracking). It’s best to get a professional to do this so you get neat, clean lines. The last step was to apply two coats of clear, matt sealer. 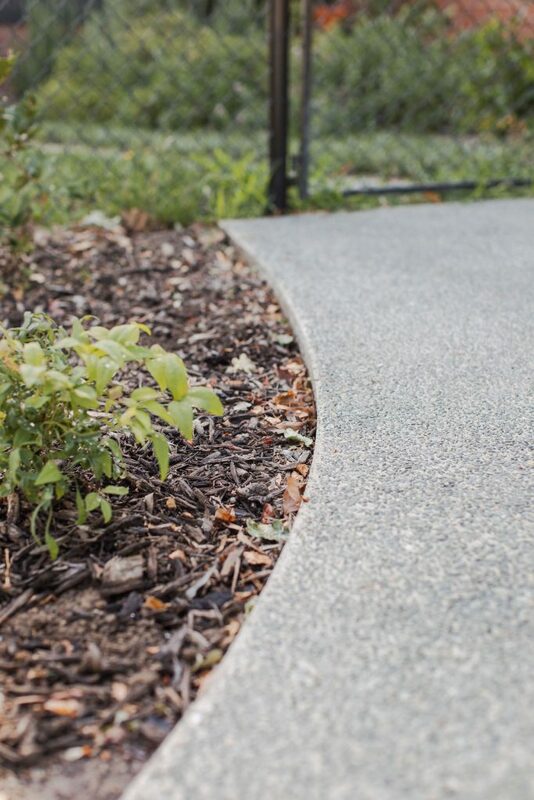 This protects the cement from staining and discolouration, and helps to bring out the colour of the stones. And here she is! I cannot tell you how happy I am to have a real driveway. I love how it turned out. I’m so glad I restrained myself and went with the simple grey stone exposed concrete. 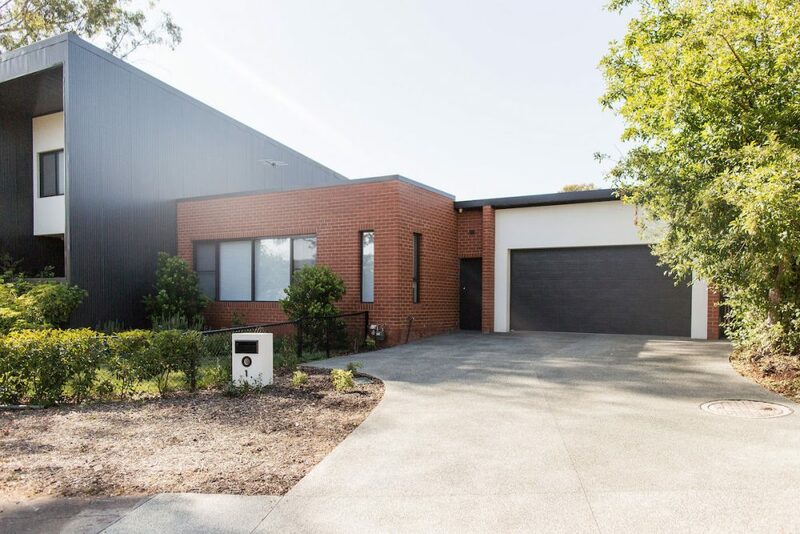 It feels in balance and the raw finish and curved shape complements our house. 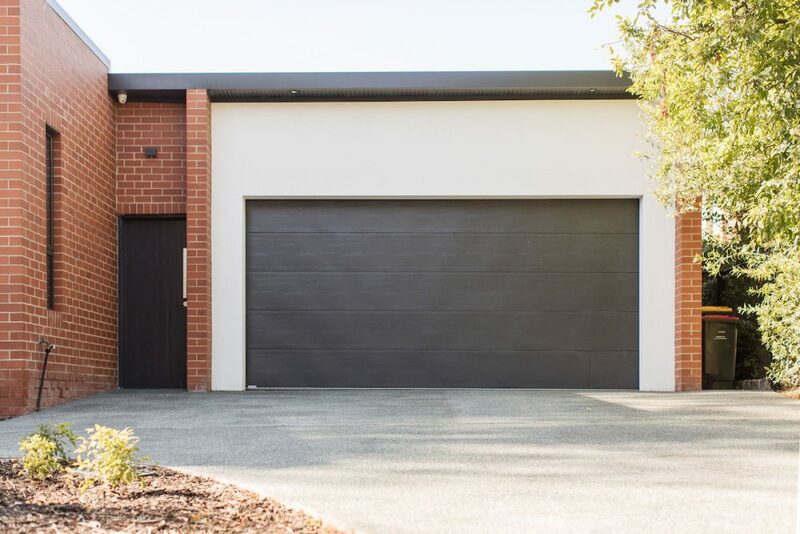 If you’re looking at getting a driveway, the team at Holcim were incredibly helpful and have many options in their exposed concrete Geostone range, including black or white concrete and a whole range of stone options too. As hard as it was to wait, I’m glad we stuck to our guns and waited until we could afford the driveway we wanted. Next article20 of the coolest Kmart hacks EVER!